Star Wars: The Force Awakens introduces a lot of new characters, ships and alien species. But the inspiration and names for this exercise in world building did not come easy. And as we've revealed in the past, a lot of the new faces on display in this long-anticipated sequel have a unique backstory. 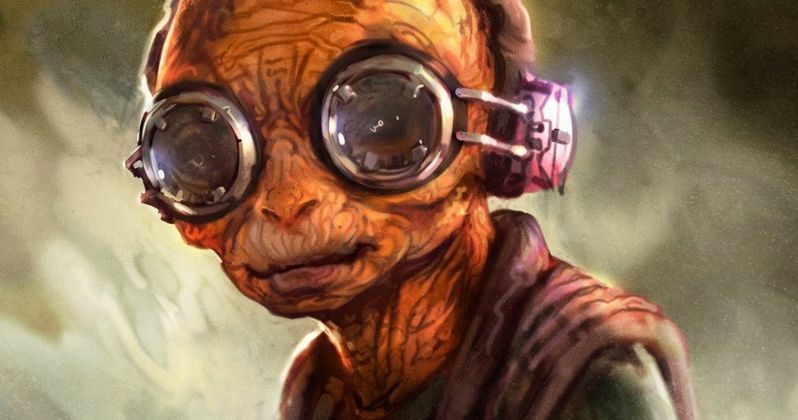 Now it's being revealed that the same is true for one of the key players, Lupita Nyong'o's Maz Kanata. As it turns out, director J.J. Abrams based this new Force sensitive, yet very diminutive being on someone very important in his life. Maz Kanata is actually based on J.J. Abrams' late Pacific Palisades English teacher. He discussed the inspiration for Maz with The Washington Post, saying that Kanata is the Star Wars universe's own version of Rose Gilbert. He goes onto explain the connection. "Yes, the character of Maz was originally based on the great Rose Gilbert. We really wanted the story to feel authentic, despite being a wild fantasy. I mentioned Rose in an early story meeting as a sort of timeless, wise figure that I'd actually known in my life." It is said that Rose Gilbert wore large glasses that are quite similar to the lenses seen on Maz when we first meet her at the castle. She served as a Palisades Charter High School teacher since it opened in 1961. She retired at the age of 94 in 2013. She was the oldest full-time teacher working in the Los Angeles Unified School District at the time. Before her retirement, she was teaching three different AP English classes in the same classroom she worked in for 51 years. Star Wars' production designer Rick Carter was also a student of Gilbert's. Says the director about this coincidence. "Turns out the production designer, Rick Carter, had also been a student of Ms. Gilbert, 15 years before me. While we experimented with many looks and styles before settling on the character's final design, Rose was always at the center of the inspiration of Maz. Rick and I had hoped to contact Rose and show her what we were doing, but she sadly passed away while we were in the prep of the film." Sadly, Rose Gilbert passed away at the age of 95 on December 16, 2013, while the film was in production. Both J.J. Abrams and Rick Carter took time off from the sequel to attend her funeral services. Now, she will be forever immortalized as one of the key players in the Star Wars universe. There is still much we don't know about Maz, and it remains a mystery how she came to be in possession of Luke's lightsaber. It also wasn't disclosed if Gilbert was as much of a fan of wookies as Maz seems to be.